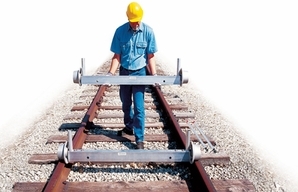 A cart of infinite length... Use two or more dollies to move long, heavy loads down track. Welded aluminum. Half the weight of steel dollies but equal in strength. Fabricated of 6063T6 alloy aluminum. Each dolly supports 2,000 lbs. Wheels 6" dia. aluminum insulated. Clearance 5/8". Dolly beam has side stake sockets and holes for passing load-strapping chains. Top surface of dolly has coarse grit stair tread tape to prevent slippage.